Air quality data collection near pollution sources is difficult, particularly when sites are complex, have physical barriers, or are themselves moving. Small Unmanned Aerial Vehicles (UAVs) offer new approaches to air pollution and atmospheric studies. However, there are a number of critical design decisions which need to be made to enable representative data collection, in particular the location of the air sampler or air sensor intake. The aim of this research was to establish the best mounting point for four gas sensors and a Particle Number Concentration (PNC) monitor, onboard a hexacopter, so to develop a UAV system capable of measuring point source emissions. The research included two different tests: (1) evaluate the air flow behavior of a hexacopter, its downwash and upwash effect, by measuring air speed along three axes to determine the location where the sensors should be mounted; (2) evaluate the use of gas sensors for CO₂, CO, NO₂ and NO, and the PNC monitor (DISCmini) to assess the efficiency and performance of the UAV based system by measuring emissions from a diesel engine. The air speed behavior map produced by test 1 shows the best mounting point for the sensors to be alongside the UAV. This position is less affected by the propeller downwash effect. Test 2 results demonstrated that the UAV propellers cause a dispersion effect shown by the decrease of gas and PN concentration measured in real time. 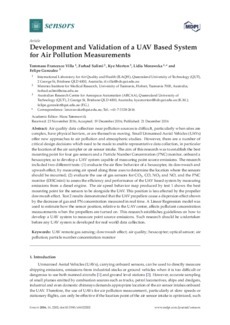 A Linear Regression model was used to estimate how the sensor position, relative to the UAV center, affects pollutant concentration measurements when the propellers are turned on. This research establishes guidelines on how to develop a UAV system to measure point source emissions. Such research should be undertaken before any UAV system is developed for real world data collection.